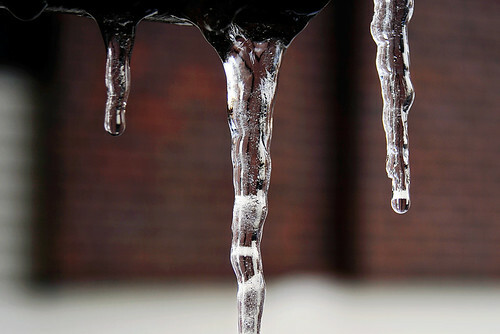 Columbia is supposed to get some snowfall again tomorrow evening, but right now, everything is generally thawing out a bit. Although, some big fat flakes were falling earlier while the sun was out. I caught at least a dozen snowflakes on my tongue. I almost choked on one of them. It’s only Day 9 of the 30-day challenge, and I’m already bored with my life / staggered over how boring my life is. I decided to break my routine. So Jeff and I went to the Green Valley Drive bridge over Hinkson Creek — just off of Broadway near Old 63 — and took some photos there. 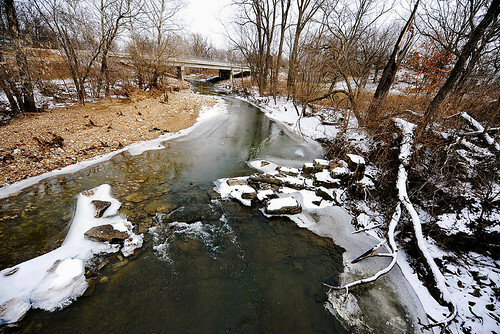 Hinkson Creek. That overpass bridge is Broadway. 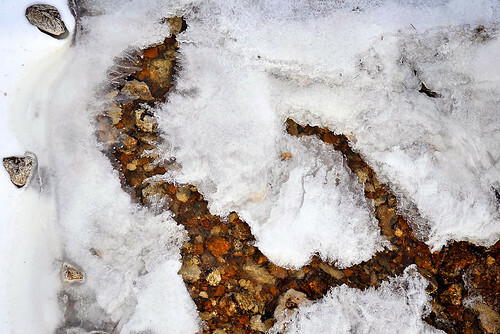 Detail of the icemelt on top of the creekwater's surface. 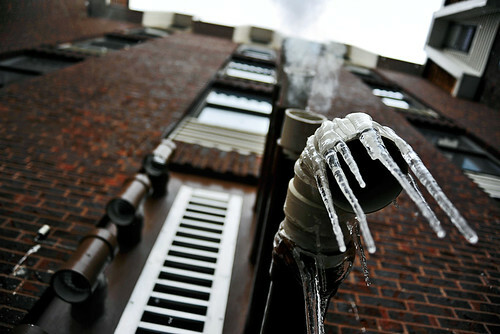 The best part is, the icicles were melting because of the laundry room's steam vents nearby. So we were constantly getting dripped on while taking photos. Tomorrow after class and an oil change, I’ll be at the fourth annual Missouri Grand Prix, where I’ll be live-editing as well as (hopefully) snapping a few photos. This and watching the Olympics are basically how I’ll be spending my weekend. I’m vastly looking forward to it. Too bad Michael Phelps won’t be there after all. Beautiful. Great compositon and if I may add, your header’s is extremely attractive; the colors are brilliant altogether.